I’m a dedicated locavore. About 90 percent of the food I eat is grown by farmers I know. I can walk through my pantry and tell you the first name of the farmer who grew everything there. Dried peppers from farmer Charles, squash from farmer Ted, hazelnuts from farmer Linda, and on and on. I go to the grocery store about once a month for things like olive oil, peanut butter, and salt. I visit the farmers’ market every weekend, pick up my Community Supported Agriculture box on Tuesdays, and just before winter fill up at Fill Your Pantry, our bulk buying event for locally grown beans, grains, and storage crops. I don’t buy bananas and I don’t eat fresh tomatoes in the winter. My diet changes with the seasons. In summer, I enjoy fresh fruits and vegetables. 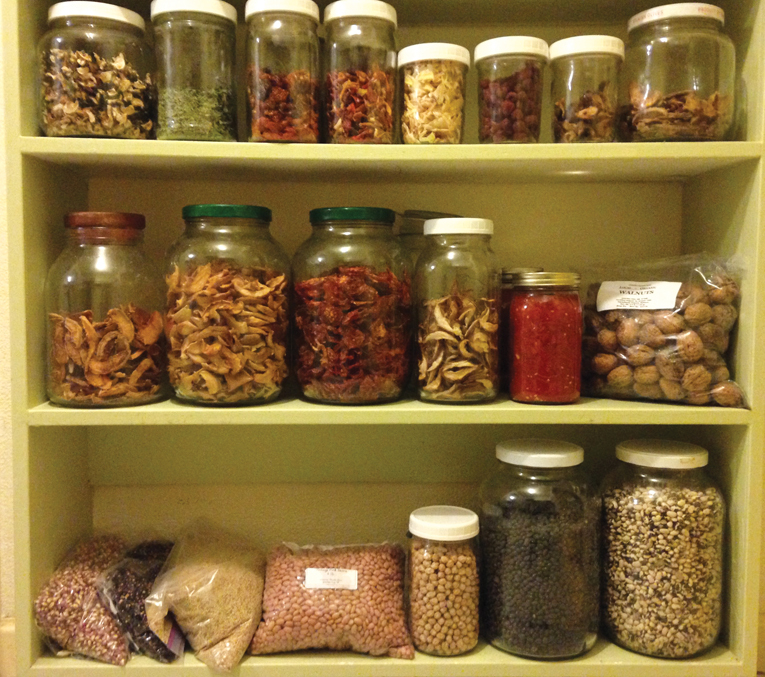 In fall, I preserve fruits and veggies like crazy and stock up on local beans, grains, and storage crops. In winter, I eat my dried, frozen, canned, and stored food. In the spring, I finish off the food I have stored from the winter and enjoy foods that are coming on in spring, eggs and greens. And then the cycle begins again. I eat this way because it connects me with the source of my food and the people who grow it. I experience the connection with every meal. It’s a relationship and it’s an important one. Beyond the personal connection, there’s a financial connection, which contributes to community food security. When I support my local farmers I hope I’m helping to provide them with the resources they need to continue farming. When they have what they need, I hope they’ll be able to grow food for me and my community into the future. The farmers who grow my food are supporting a healthy planet. The personal relationship I have with them allows me the opportunity to learn about their growing practices. I can intentionally choose to buy food from farmers who grow food using the most sustainable practices. By supporting them and those practices, we are promoting environmental health together. This is another part of the relationship. I’m concerned about climate change and associated disruptions to our food system now and in the future. I want to help create a future where my local farms are able to feed our community when food system infrastructure like semi-trucks traveling up the interstate from California aren’t an option. So I support the people who I hope can feed my community if and when bigger systems fail. In addition to being close by, my local farmers are more likely to grow crops which are well adapted to our local climate and those that are more likely to survive climate extremes. I support farmers who are developing crops that can weather extremes. I want them and their crops to be around in the future. All of these pieces together—the opportunity for me to support farmers financially, in turn being sustained by the food they provide, being connected to each other, and knowing about and supporting their sustainable growing practices—mean that I am helping to create a strong and resilient local food system and a healthier community. Megan Kemple is a dedicated locavore living in Eugene, Oregon. She is the Farm to School Program Director for Willamette Farm and Food Coalition, a community-based nonprofit working to create a secure and sustainable food system in Lane County, Oregon. Sounds dreamy…But what is to keep those same farmers who you are supporting with your dollars from shipping those dollars overseas by, say, buying tractors from China (thus ending the dream to ‘keep it local’)?